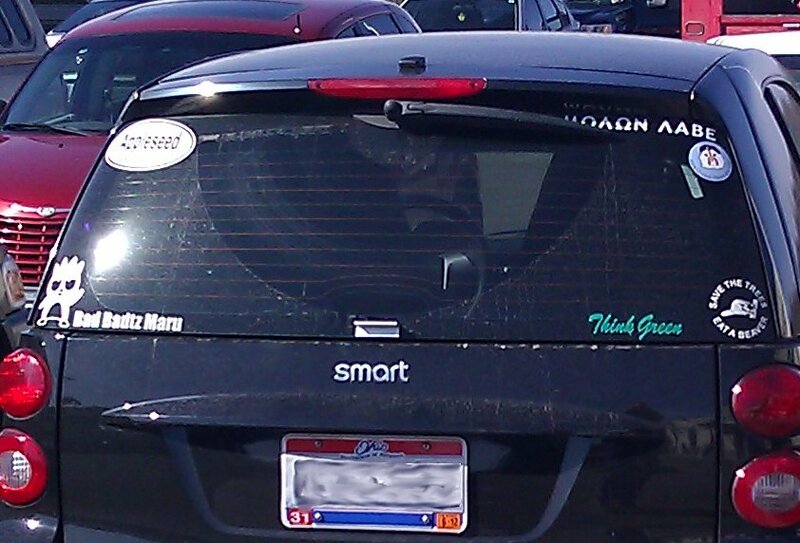 Seen at Gander Mountain--a Smart car, with pro-gun bumper stickers. Appleseed is essentially a history and rifle clinic, and the sticker in the upper right is 'molon labe', which translates to 'Come and get it', with a further "from my cold, dead hands" implied. 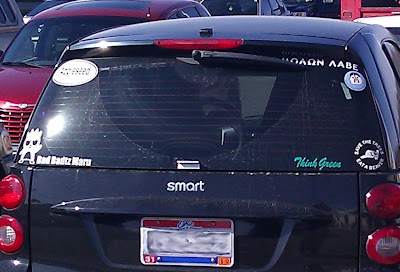 Not quite the neo-hippie signs you expect on a Smart. This is a visual representation of two songs--one is "Kid Charlemagne", a fairly fast paced, dense and intricate song, the other is "Ain't Nothing Wrong with That", a very funky song featuring heavy use of bass drum, and an electric pedal steel guitar. If I had to describe the rhythm of 'aint' nothin' wrong..." in words, 'Whump' would almost have to be one of them. You can see a drastic difference in how these songs show up visually--one of them is dense and smooth, the other has lots of variation. ...except 'Ain't Nothing Wrong with That" is the one on top that looks smooth and dense. 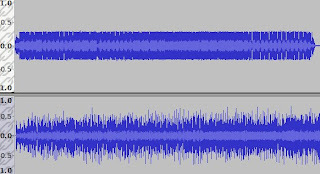 The difference isn't in the songs themselves, it is in how and when they were recorded, and illustrates a huge problem with music today, the Loudness War. CD's and most other digital recording formats have a maximum peak volume that is impossible to exceed. When a song is recorded or mixed, you can still increase the average volume by removing room for contrast, making every part of the song equally loud--however gone too far and the music will be muddy and indistinct. Why would you do that? Because when comparing songs, people tend to prefer the slightly louder one. It is possible to increase the average volume slightly without significant damage to the overall sound. The problem here is that the competition has already done that, so you need to do it even more, then they do...until there's no dynamic range left, no contrast, no impact, and every part is as loud as every other part. Some people say they prefer old vinyl albums to CD, that the vinyl sounds more natural. It isn't that vinyl is better as a medium (it isn't) but that it doesn't allow this sort of abuse. There is a good bit of new music that I sort of like...but the way it is recorded makes it unpleasant for me to listen to--the song has to stand out quite a bit before I'll put up with this hyper-compressed mushy-sounding recording. Why is the Department of Homeland Security protecting us from copyright infringement? Or rather, alleged copyright infringement, since they were able to shut down these websites without due process, based entirely on allegations that they linked to other websites where sporting events were rebroadcast. These sites are not based in the US, and aren't meant for a US audience--however the domain registries (people who give out website names) for .com and .org are US based. This is the problem with giving the government broad powers to fight terrorism, violence, or whatever scary excuse for expansion is current--especially giving those powers without due process and oversight. Homeland Security should be concerned with physical threats to the people of the US--not the well-being of ESPN and other networks. Expanded powers meant to fight terrorism should be restricted to real. physical terrorism--and even then, we need to be careful that the cure isn't worse than the disease.